The story of Tasmania’s electricity market gets murkier by the day. To the public shock over power prices has been added a spate of seemingly absurd decisions to buy power from far-away Queensland. But in this new-age energy market, a lot of things become possible. Late last month the government awarded a contract to a Brisbane-based private company, ERM Power, to supply electricity to the Department of Premier and Cabinet along with a swag of other departments covering primary industry, parks, water, environment, police, emergency services, economic development, tourism, arts, education and justice. A week or so later the Department of Health and Community Services announced it too was opting for ERM’s lower prices ahead of the local supplier, Aurora, leaving only two departments (Treasury and Infrastructure, Energy and Resources) still getting their electricity from Aurora. The new deals don’t mean the government will be getting electricity generated in Queensland; in fact most of it will be good old hydro power. That’s one of the quirks of the National Electricity Market (NEM), which gives energy companies access to generation and transmission capability across all Australia except Western Australia and the Northern Territory. Tasmania joined NEM in May 2005, a marriage consummated by the Basslink start-up a year later. But as much as 10 per cent of electricity can be lost in transmission and the greater the distance the bigger the loss, so locally-sourced electricity is always preferred. Despite Basslink, most of the power that ERM is selling to the government is likely to be Tasmanian power supplied by Hydro — the same source as Aurora power. The difference is that the local retailer loses the business, which is another story for another time. Tasmanian homes and small businesses currently lie outside the “contestable” range, denying them access to retailers besides Aurora. But the introduction of the so-called “Tranche 5a” competition due in July 2011 will see the Tasmanian retail market opening up to another 3500 businesses which each year use over 50 megawatt-hours (costing at least $10,000). ERM, Australia’s largest privately-owned power company, started expanding aggressively in the 1990s. With interests in coal-seam or natural gas power stations in Queensland, New South Wales and Western Australia, it entered the retail market in 2007. It is one of five retailers operating in Tasmania. The domestic market in Western Australia and the Northern Territory (which remain outside the NEM) is still pretty much a monopoly, but it’s contestable everywhere else — except in Tasmania. This is a big issue, says Marc White, principal consultant at Hobart-based Goanna Energy Consulting. The other big issue is the energy market’s structure. “Vertical integration” (whereby single entities serve as power generators, transmitters and retailers) became a definite no-no under new-age energy policies, so all states began to break up their public utilities and sell off what they didn’t want. 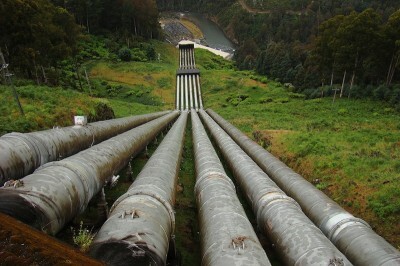 In Tasmania, the Hydro-Electric Corporation was broken up into Hydro Tasmania (generation), Transend (transmission) and Aurora Energy (local distribution and retail). Such structural disaggregation carries financial risk, and in some countries including the United Kingdom there have been moves to re-integrate. In such scenarios, says Marc White, generation and retail in combination can offset each sector’s risks while distribution and transmission are operated as asset-managing monopolies. Retailing is only half the story. In contrasting our “clean, green” hydro power with dirty brown coal across Bass Strait, we’ve tended to overlook some energy cost benefits accruing from strong competition among Victoria’s privately-owned generators. We, too, need to look at how our generating sector, and our Bass Strait power link, might better serve us and interstate markets in a post-carbon world where hydro power should carry market weight. Some serious restructuring would be necessary if Tasmania’s electricity generation were to join retailing in a contestable market, yet trends elsewhere suggest this may well happen in the not too distant future. All three government-owned energy companies may be in for another big shake-up. Whatever the longer-term outcome, it’s fanciful to think we can somehow turn back the clock to the days when governments alone could determine electricity prices. There’s no unscrambling this egg. This entry was posted in business, investment, employment, economic activity, energy, gas-fired, hydro, social and personal issues, social mindsets and tagged Aurora Energy, Australia, Bass Strait, Basslink, business, investment, employment, Chris Harries, climate change, economic activity, energy, ERM Power, gas-fired, global warming, Goanna Energy Consulting, hydro, Hydro Tasmania, Marc White, National Electricity Market, NEM, Queensland, social and personal issues, social mindsets, Tasmania, Transend, Victoria. Bookmark the permalink.